The R.E.M. new release marketing juggernaut continues with your opportunity to remix the new tune It Happened Today. Download the stems here and see if you can do better than Stipe and Co.
Oh My Heart is available for a limited time as a free download via Amazon MP3 here. Discoverer is now available as a $1.29 download via iTunes here. Check out the new "film" of Mine Smell Like Honey below. Remember when they used to be called videos? 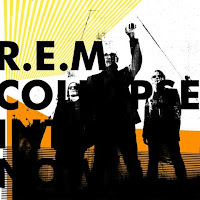 Collapse Into Now is out one month from today. That's March 8.